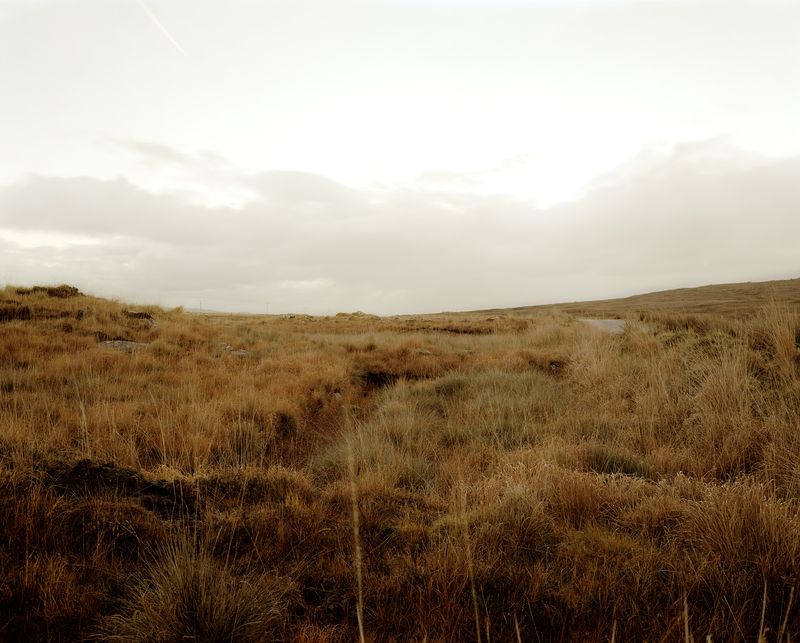 Inland is a series of landscapes that Perry started in 2004 in both West Wales and Ireland. As in the Beach series, Perry set out to explore a territory between landscape photography and painting. But unlike Beach – where the unstinting presence of the flat horizon provided a motif that defined the body of work as a series – these pictures are looser and less formal in their concerns, offering a more mysterious sense of place. They are also documents of environmental change and unsustainable farming practice. 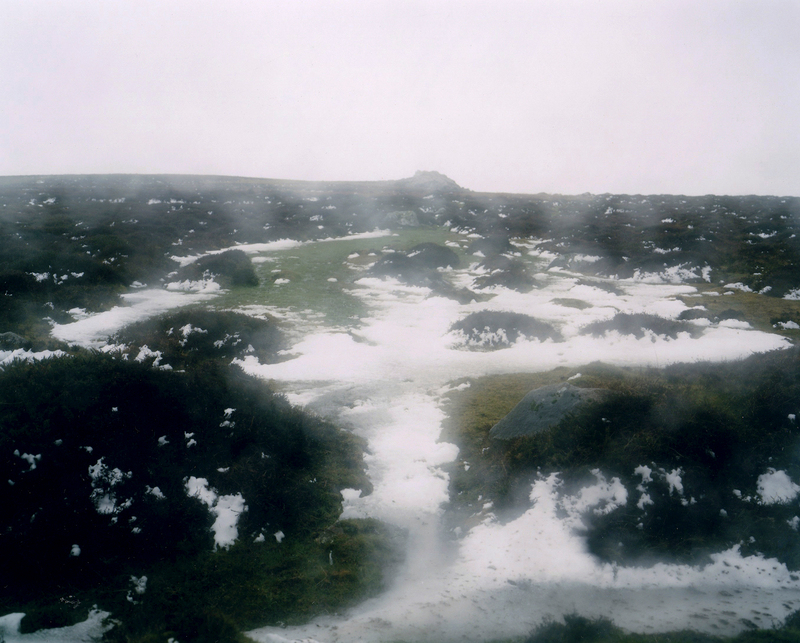 Using his large-format field camera, Perry took the bulk of these photographs during the winter months in and around the Preseli Hills in Pembrokeshire. He avoided the twilight, or magic hour, as well as the more dramtic topography, choosing instead flatter daytime light and mundane perspectives, lending the work an overall air of meloncholy and isolation. Indeed, some of the pictures were taken in the rain through his car window. Perry also experiments with perspective, adjusting his own position to give the viewer an indecipherable sense of space. 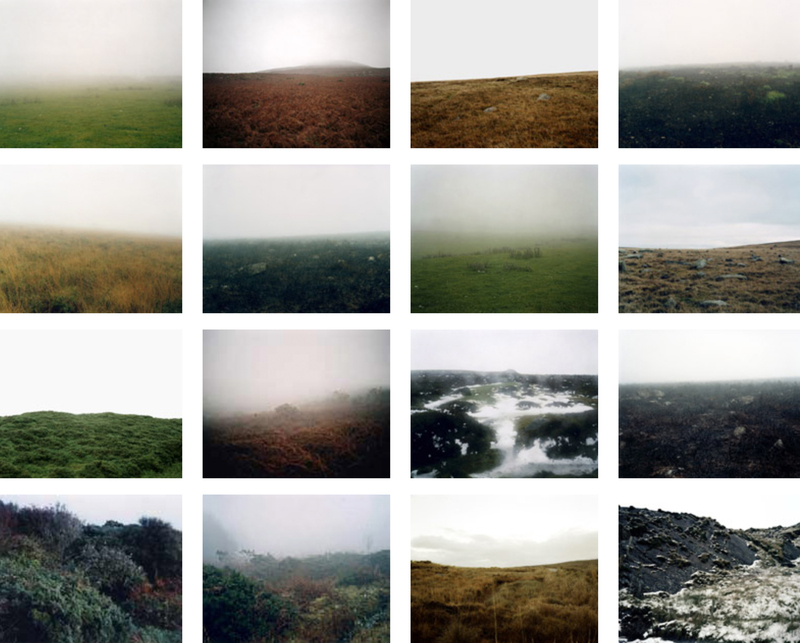 By using shorter depth-of-field and uneven horizons, he invites the viewer to experience the pictures both as formal compositions, releasing the expressive power of a pacth of grass or misty crag, while at the same time he never ignores the factual intensity of the actual locations. 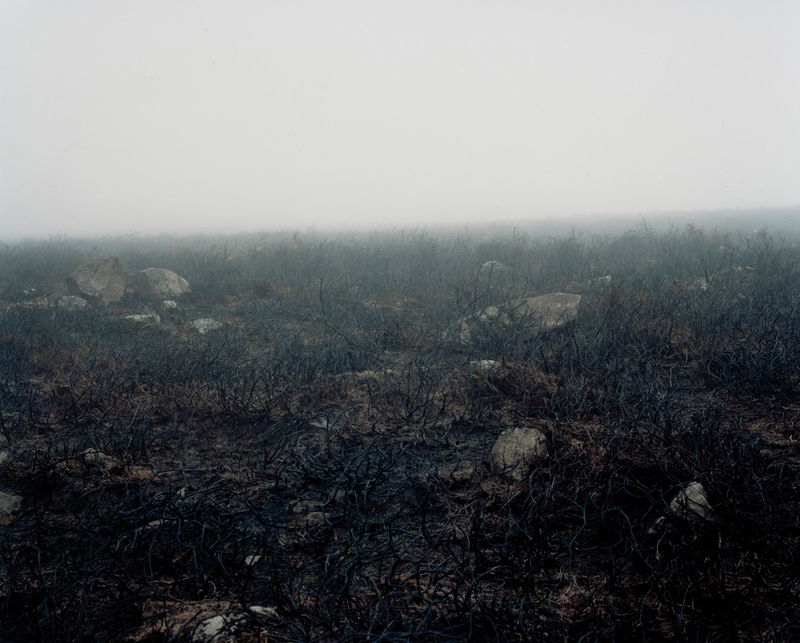 Indeed, whilst these landscapes at first appear empty, closer inspection reveals the impact of human presence, be it in the form of the odd fence, traces of sheep grazing, or a path. Mainly they depict land that has become degraded by continuous sheep farming. This is not nature in it’s fullest glory but nature as it is. Or how Perry sees it. 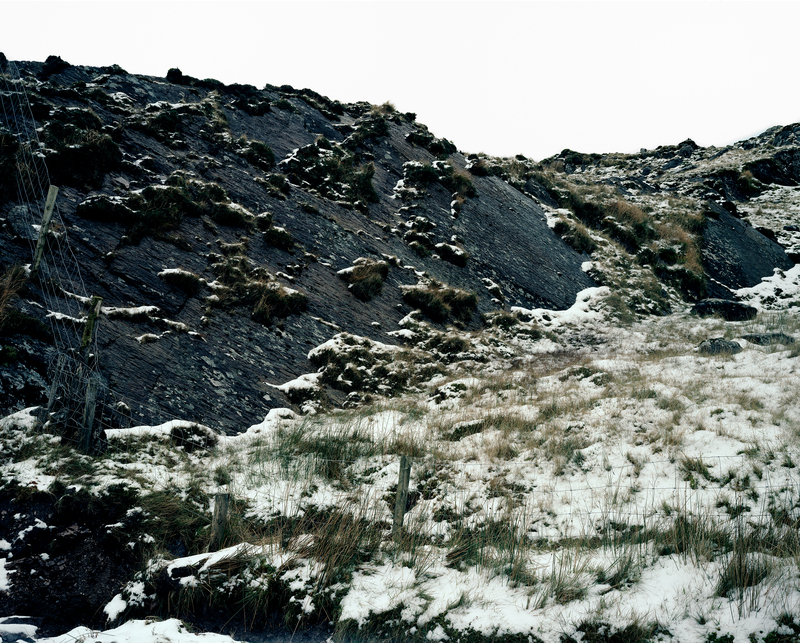 By capturing these fragments of an imperfect landscape Perry has managed to portray a powerful spirit of place without a traditional narrative, finding beauty in what others might view as the mundane. Perry has choosen to present much of the inland series in the form of grids and small groups of similar images. Part of the reason is his desire to show, as he did in his Beach series, the infinite changes in colour and light within such a small geographical area. 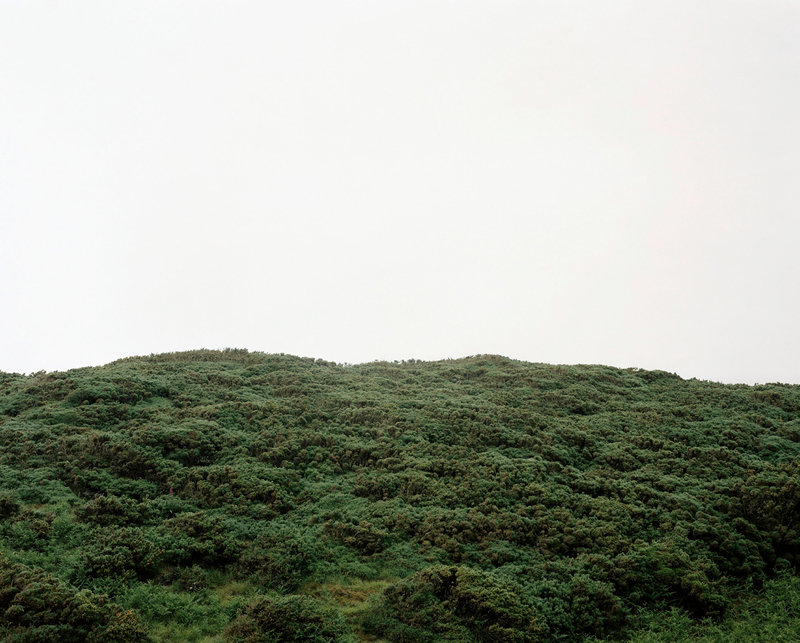 Whereas the beach series was taken from one stretch of of mundane coast line in southern England, the Inland pictures are mainly from the hill behind his farm in West Wales. But he is also interested in the spacial engagement of the different works and has quoted Olafur Elliasson and the Bechers Typologies as important influences. In Green Gorse, Pembrokeshire 2003, Perry frames a slab of green vegetation against a neutral white sky to provide a formal minimalist abstraction. Shooting up hill, from the coastal path, with no other form of reference it is difficult to get a feeling for the position of the artist. We could well be looking down over an emerald green rainforest as in Alex Hutte’s dramatic photographs in South America. Instead, closer inspection reveals only scraggy green gorse. Maybe this tangled growth, that has taken over vast areas of coastal land due to continuous sheep grazing, is West Wales’s equivalent of Europe’s grand vertical forests.